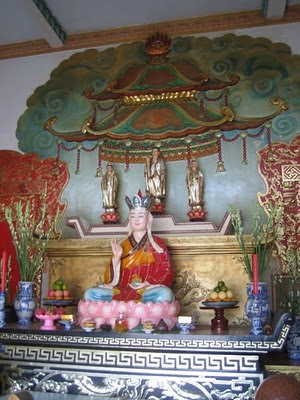 Dia Tang is the Vietnamese name for Ksitigarbha Bodhisattva (Di Zhang Ch., Jizo Jp.). 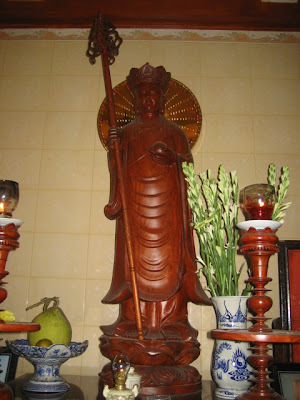 He is the protector of the dead, and is the deity that is revered during memorial services for deceased relatives. As such, he is a very important part of Vietnamese Buddhist ritual life. His special celebration is during the festival of Vu Lan, where his legend has become enmeshed with that of Mahamoggallāna, who is said to have seen his mother in the realms of hell and to have petitioned the Buddha to take pity on the dead. So sorry but I missed your question. The second pic is from Chua Khuong Viet on Pham Van Hai St in Tan Binh, Ho Chi Minh City.